I've been a fan of Duane Swierczynski's writing for a long time, and I ended up translating his break-through novel The Wheelman in Finnish. Later on I also translated The Blonde. 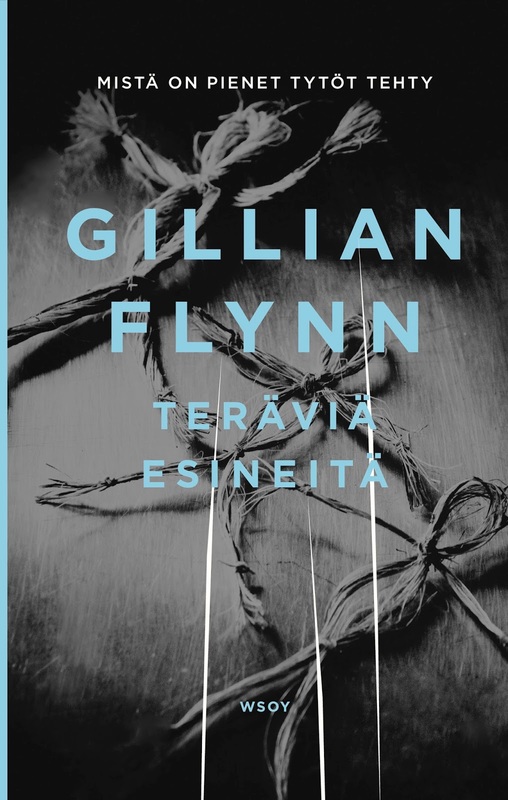 The books weren't big hits, to put it mildly, but the Finnish crime fiction market is now flooded with Scandinavian titles, and we have also lots of our own crime writers, though not many seem interesting to me. The books don't sizzle the way Swierczynski's books do. 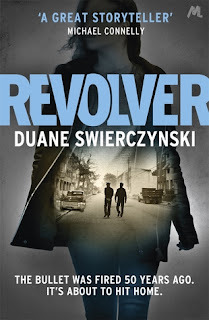 And Revolver, Swierczynski's newest novel, sure sizzles. It's a tale of three generations of cops and possible future cops (the latest one in the line is studying forensics), and the murder of the cop of the first generation. In the first story line, Stan Walczak and his black friend, Wildey, work in the 1960s Philadelphia with all its racial tension. They end up getting shot, and the case if officially closed. In the second story line, Stan's son Jim, also a cop, is digging in the 1990's into a murder case that seems like a serial killer on the loose. The third story line is about Audrey, the daughter of Jim Walczak, who, as a part of her exam, is trying to dig into Stan's killing in the present time. Audrey finds new evidence and the plot starts to unravel. Swierczynski shows that racism hasn't ceased in the USA. He out-Ellroys Ellroy with his depiction of the corrupt society and the secrets cops have had to take part in. The book shines especially in the delivery of the three separate story lines. Swierczynski also creates a great female character in the daughter. Audrey is a troubled young woman who doesn't really love her family and feels like no one loves her. She's smart and stubborn, and she consumes large quantities of Bloody Marys during the course of the book. I was actually starting to feel I'd have to have one myself. Lately I've been reading stuff that's been loaded on my Kindle, something I haven't been doing for ages. 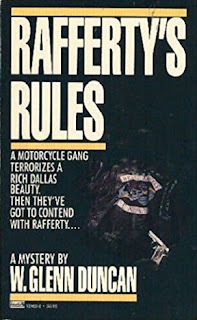 One of the books I've now read was Rafferty's Rules by W. Glenn Duncan. I think it was author Paul Bishop who said good things about the Rafferty series over at the Men's Adventure Paperback Series Facebook group some weeks ago, so I decided to give it a try. Rafferty is a private eye working in Texas. Rafferty's as hardboiled as they come, yet he smokes a pipe - for some reason or another, this bugged me a bit. He dates an attractive woman, Hilda Gardener, who's also an antique dealer, and he also has a sidekick called Cowboy. There's something a bit too Spenserish in the set-up, and Robert B. Parker is one of those private eye writers who briefly turned me off the genre 20-plus years ago. I still can't stand him (or his books, to be precise). 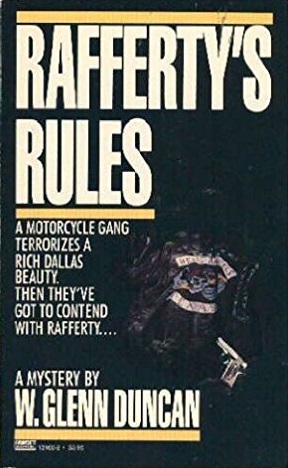 Rafferty's Rules however turned out to be a piece of nice entertainment, no matter how much Spenser there is in the book. Rafferty is hired to take care of some bikers who kidnapped and raped a young woman who later turned out crazy. Rafferty says he won't kill the molesters, but goes after them nevertheless. The case turns out to be more than that, as is usual the case with hardboiled private eye novels. The story moves along nicely and there are good action scenes throughout. The Texas settings reminded me of Joe R. Lansdale's Hap and Leonard novels, but they are better. There's too much cute stuff here, such as Rafferty eating nice lunches with Hilda. There are several more books in the series that was originally published in 1987-1990, but I still won't go out of my way to find them. Here's Kevin Burton Smith at the Thrilling Detective on Rafferty books. 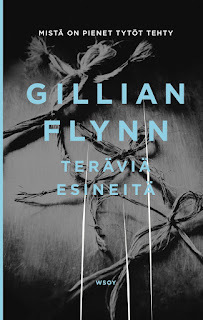 I liked Gone Girl quite a bit, but I liked Gillian Flynn's earlier novel, Dark Places, much more. It was darker and pulled me in with its dirty secrets the way Gone Girl never did. The main character is a female journalist, Camilla, who's assigned to cover a possible serial killer case in her hometown. Flynn describes the abysmal feelings that Camilla has go through to get the story done, she lives with her well-to-do mother, her icky husband and their awful teenage daughter, meets all her school mates, eats at the greasy joints, goes to lousy bars. (And she drinks quite a lot - I was thinking all the time: where are my Bloody Mary ingredients?) And Camilla is no pleasant human being to begin with. Flynn is very adept at describing unpleasant characters that the reader cares about. The secrets of a small Missouri town are dark and murky indeed, and Flynn guides the reader's suspicions artfully. The final twist pulls no punches. Highly recommended - this is also shorter than Gone Girl, which I thought was a tad too long. There's also the fact that Flynn has no series characters. I couldn't take it if the Camilla of Sharp Objects would be the lead character in Dark Places! Here's hoping the publisher won't require Flynn to create series characters.